The start line is usually on the beach for an open water swim. Don’t try to get to the front unless you are a really fast swimmer. Keep to the side of the pack. This gives you more space to swim in and you’re less likely to get your goggles kicked off. Like most people, this is the stage I find most challenging. I’ve just learnt to keep calm and keep going. I’m not interested in a rugby scrum in the water. Put your helmet on first. This is the biggest mistake people make. If it’s the first thing you do, you won’t go far wrong. If you remove your bike from the stand without your helmet fastened you will be disqualified. Mistakes are one of the best ways to learn. You’re unlikely to make the same mistake twice, particularly if it’s an embarrassing one. I’m still red faced from the time I fell off my bike. I had failed to recce the course properly and approached the dismount line too quickly. Of course, you get disqualified if you pass this line on your bike. In my panic I braked hard, stopped in time…but forgot that my shoes were still attached my to bike. Comically for everyone else, I just slowly fell sideways. I won’t be doing that again. This is where the race is won, and if you’re a strong runner you can make good ground during this stage. That said, you’re legs will feel completely alien to you. When you’re training practice a long bike ride followed by a run to get used to running with jelly legs. It’s quite comical seeing everyone start their run stage as if they are members of Monty Python’s Ministry of Funny Walks, but the good news is the affects soon wear off. The bad news is that exhaustion can set in. Just remember it’s supposed to be fun. 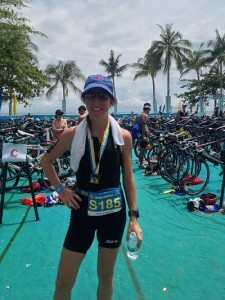 Sprint: 750m swim, 20km bike, 5k run. This is a good introduction to the sport, but it’s no fun run. You pace needs to be quick to get ahead of the field. Olympic: 1500m swim, 40km bike, 10k run. This event is more about endurance. You need to be able to last the distance. Half Ironman: 1.9km swim, 90km bike, 21.1km run. You may find that you excel in one discipline over another, which gives you the chance to gain ground, unlike single discipline sports. Ironman: 3.8km swim, 180.2km bike, 42.2km run. Could you run a full marathon after a swim and a cycle? If the answer is yes, then sign up for this one.